I'm fond of Kits not only because of the relaxing and youthful vibe of the general area, but also the interesting array of small restaurants that line the streets. The area makes for a good place to sit back with a coffee for a chat with friends. I'm sure most Vancouverites know about 49th Parallel by now but I just had to blog about this place after my visit to it's West 4th location a few days ago. There was a pretty darn good deal going on - a coffee and daily doughnut for only $4.50 (keeping in mind that a doughnut is $3.25 and a coffee is roughly $2.50). I was so tempted to get it but found that the featured doughnut wasn't the one I had my eye on. I settled for a macchiato ($3.25) while my friend ordered a mocha ($4.50). Both not too bad or short of the quality at many other local coffee shops. I do love the presentation though, the wooden board for my macchiato and the matching branded cup and saucer (which would have been much nicer if not for my friend's clumsiness which spilled half his drink) for my friend's mocha adds character to a drink before even sipping it. I guess the dirtied saucer says a lot about my friend's character as well.... just kidding haha. 49th Parallel Roasters doesn't only brew coffee, but serves the infamous Lucky's Doughnuts which are baked fresh everyday and put on display in their large glass case at the counter. Not an amazingly large selection of doughnuts, but enough to satisfy a decent variety of people. My friend and I decided to try the coconut bismarck, lemon bismarck, as well as the apple bacon fritter which were all roughly $3.25/doughnut. I've never tried a bismarck before but I was glad I took the chance this time. The coconut bismarck was light and fluffy, with a generous amount of creamy coconut cream and topped off with a crisp vanilla glaze. 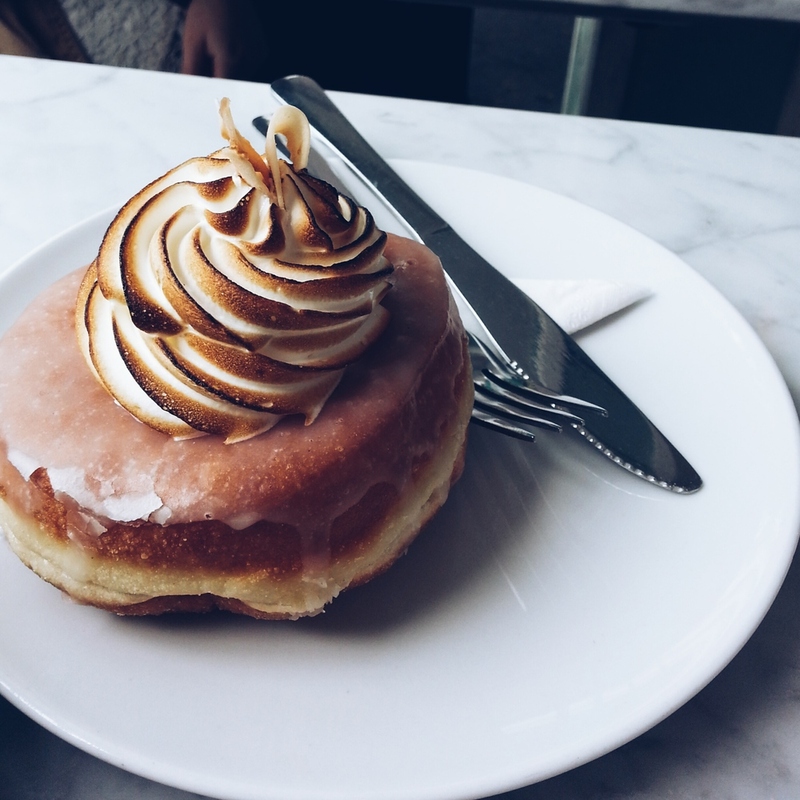 Despite the meringue on top, this doughnut wasn't too sweet to my liking. We also tried the lemon bismarck which had the same bun but was instead filled with lemon curd and topped with granulated sugar. I wasn't too fond of this one since the lemon was more sour than I expected but I did enjoy the slight crunch from the sugar on top. The apple bacon fritter looked interesting but I wish the apple flavour was stronger to go with the bacon. I like my fritters slightly soft and fluffy on the inside so I was a bit disappointed to find that mine was relatively dry. I did however, like the maple glaze. I absolutely loved the interior layout and decor of the store. I would've loved the exterior (patio) too if it wasn't for the rainy and cold weather that day. Large windows, open layout, great seating options, and a white, marble, wood, and mint rustic theme. I'd love to come back for a coffee catch up with friends.